June 6, 2014: The United States Postal Service introduced two new stamps featuring iconic hot rods. 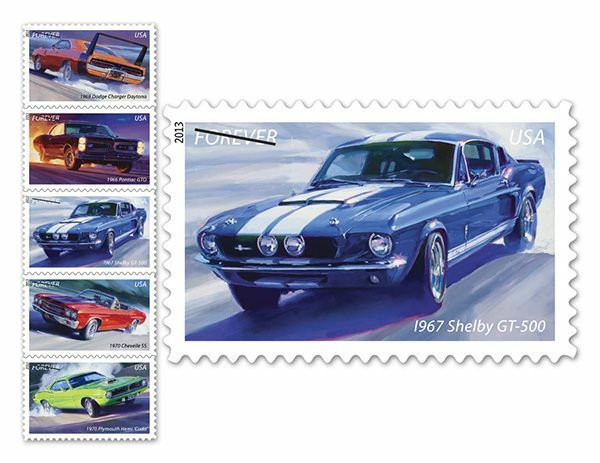 Since February, 2013 the USPS has been offering a forever stamp commemorating muscle cars. For a little over a year, the USPS has been offering the Muscle Cars forever stamps featuring five iconic automobiles: the 1966 Pontiac GTO, the 1967 Shelby GT-500, the 1969 Dodge Charger Daytona, the 1970 Plymouth Hemi 'Cuda, and the 1970 Chevelle SS. As of this writing, they are still available, so get them while they last.